The Zelite Infinity Chefs Knife pairs beauty and brawn to create this professional chef knife. The impressive Damascus pattern can even distract you from how effortlessly it cuts, which is why this knife is worth its higher end price tag. Premium Japanese steel, known as VG-10 Super Steel, and high-carbon stainless steel comprise the blade. Combined with a liquid nitrogen tempering process, the result is a non-stick, sharp, durable edge. The Damascus pattern is intricate and eye-catching, and will surely get the attention of your guests. The full tang and solid handle gives the knife a solid, but not a heavy feel. The handle is rounded, designed for a secure but comfortable grip. 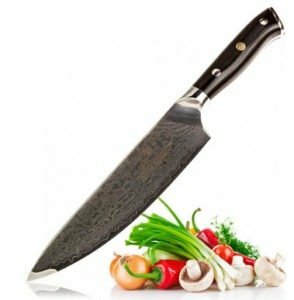 The best chef knives won’t tire your wrist out quickly, and the Zelite Infinity Chefs Knife weighs 8 oz, which is average for this type of knife. The edge is sharpened between 12 and 15 degrees, common in Asian knives. However, the solid design and feel of this knife are more in line with Western design. The result is a unique and efficient blade. So, how sharp is this knife out of the box I hear you asking? Why not take a look for yourself. The 67-layer Damascus is more than just eye candy. This knife is very sharp and has an edge that will maintain its sharpness. The blade glides effortlessly through fruit and vegetables, so it’s ideal for making thin slices. The reduced drag means little or no food sticks to the knife while you’re slicing and dicing. The handle is very solid but still ergonomic. It was designed with comfort in mind, which can save some wear and tear on your wrist if you use it often. It’s triple-riveted to the full tang, which will keep the handle secure through years of use. The liquid nitrogen tempering process helps this blade remain rust/stain free and very sharp with regular maintenance. The Zelite Infinity Chefs Knife has a spot on the best chef knife list because it’s made to last. Compared to the other best chef knives, the Zelite Infinity Chefs Knife is one of the priciest. It’s considerably more than some knives on the list. The large Zelite logo printed on the side can distract from the natural beauty of the Damascus pattern. The size and placing of the logo are reminiscent of a billboard advertisement. The Zelite Infinity Chefs Knife is made from high-quality steel for a very sharp edge that maintains it’s sharpness over time. The triple riveted handle is reliable, ergonomic, and balanced making the knife comfortable to work with. No short cuts were taken in design or material, making this a high-performance chefs knife built to last.